In those eight years, she wrote or cowrote four major articles….She also wrote three shorter but still substantial pieces….Quantitatively, this is quite good output for eight years as a working scholar. ….Moreover, two of her articles have been judged to be quite important by her colleagues. Presidential Administration has been cited 305 times in law journal articles (according to a search of Westlaw’s JLR database) — an extraordinarily high number of citations for any article, especially one that is less than 10 years old….Chevron’s Nondelegation Doctrine has been cited 75 times, a very high number for an article’s first 10 years; I suspect that only a tiny fraction of one percent of all law review articles are cited at such a pace. Private Speech, Public Purpose has been cited 129 times, likewise a very high number. ….On then to my own evaluation of the First Amendment articles: I think they’re excellent. I disagree with them in significant ways […] But I like them a lot. This answers the tenure question, I think. 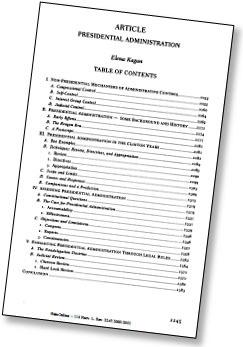 In 1995, when Kagan was granted tenure at the University of Chicago, she had two major articles and three shorter ones that were either published or in press. If the quality was good, I imagine that’s normally plenty. And contra Campos’s view that “Kagan’s scholarly writings are lifeless, dull, and eminently forgettable,” Volokh suggests they’re actually quite good, based both on his own opinion as well as how often they’ve been cited. Now, maybe these concerns will remain marginal in the face of a selection that enjoys the support of Republican elites. But the last 15 months have shown that, in the face of conservative outrage or organized Republican opposition, the support of a smattering of Republican elites tends to melt away very quickly. What Republicans are going to want to invite a Tea Party-backed primary challenge by voting to confirm Kagan? In the end, I think no more than a couple GOP Senators will be left standing. If the White House predicts a 70+ vote cakewalk, I suspect it’s mistaken. I have a feeling Jon is right, but I hope he isn’t. Partisan opposition to Supreme Court nominees has been increasing for more than two decades, and we really can’t afford to get to the point where these things become literally party line votes. Unfortunately, although I think Republicans have offered greater provocation in their choice of nominees, the evolution of increasingly partisan votes is something where Democrats have probably been the guiltier party. So the moral high ground is a little ambiguous here. Still, the fact remains that Kagan is a moderate appointee, and at the very least she deserves to get confirmed by the same kind of margin that John Roberts did.